QuARTz shower channels allow the bathroom floor to take on a new dimension to become an integral part of the design. Eliminate barriers in the shower layout for level threshold designs. Compatible with different floor structures. Complicated floor slopes are eliminated, simplifying tiling. 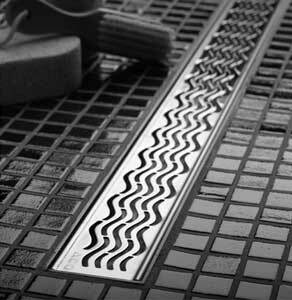 QuARTz linear shower drains are designed to last. QuARTz Plus is available in complete units only. 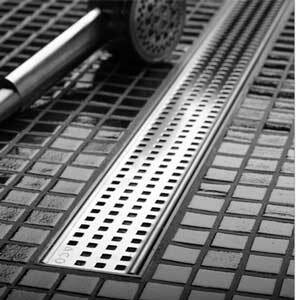 The channe; is ABS and the grates are 304 stainless steel. QuARTz Plus is available in 2 sizes and 2 design options. The units come with a 2″ threaded coupling that is compatible with any standard 2″ shower drain flange, thus making the product universal and easy to install in any application. We are the online source for ACO Showerdrains including QuARTz Plus with shipping to all across Canada and the USA including British Columbia including areas of Vancouver, Victoria, Kelowna, Abbotsford, Kamloops, Nanaimo, Chilliwack, Prince George, Vernon, Courtenay and municipalities of Surrey, Burnaby, Richmond, Abbotsford, Coquitlam, Saanich, Kelowna, Delta and Langley Township. If you are renovating, redesigning your bathroom or simply needing a new shower drain, let ACO Showerdrains QuARTz Plus add class and style to your Bathroom. We also ship to Manitoba including cities of Morden, Winnipeg, Steinbach, Portage la Prairie, Dauphin, Brandon, The Pas, Thompson and Churchill. And so, if you are looking for a quality shower drain at an affordable price, consider ACO Showerdrains QuARTz Plus from Bliss Bath & Kitchen.